Yesterday I sold my motorcycle. Today I was finally able to delete my last voicemail from my dad. The two are not separate. I have always known I wanted to get my motorcycle license. At some point, it was going to happen. In old family movies, there is one scene of a very itty bitty me after I’d been hoisted up and allowed to sit on a cousin’s bike. I am grinning with my whole itty bitty body. When I lived in Indonesia, I was giddy when I got to rent small displacement bikes and zip around the islands. It was the fulfillment of some very deep-seated very long embedded dreams. 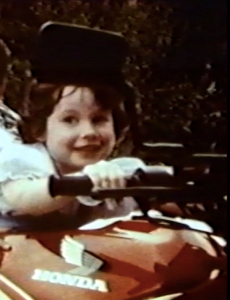 I’d be sat on the bikes, finally doing the driving, and still grinning with my whole body. As I closed in on 30, I suddenly realized I had the time and means to make this happen for myself — to get my motorcycle license. I even had a parking spot, sitting there, just waiting for two wheels to occupy it. So I got rolling. I signed up for lessons, still not sure exactly what my plan was (would I buy a bike? what would I use it for? would I ride alone, or find others to ride with?). But I started down the path figuring I’d figure it out as I went. Then my dad, who I also adored with my whole being, suddenly had serious health problems. As I was taking my motorcycle training, he was being admitted to hospital. As I was shopping for my first bike, his was worse and worse news (though always delivered as if it were not). When I narrowed in on a particular bike, he had me tack up a picture of it up in his hospital room. When I came to visit, we would talk about how it was going. It was the thing to talk about that wasn’t the big scary thing in front of us. A redirection technique at which my dad was a master. In my last voicemail from him, the one I’ve been resaving for 4 years, he is phoning me to celebrate the removal of his chest tube. He is proudly telling me how he got to help remove it himself, and how it means that he will be out of there in 24-30 hours (“Colour me excited”). He said he was just happy about it, and wanted to share that with me. Then he goes on to ask how it is going with shopping for my motorcycle, and hoping it’s going well, whether I’m just scoping out or if I’m buying. Then he signs off and hangs up. Every time I listen to his message, I think of when we spoke when he first woke up from hip surgery. How he said that day, when he woke up, it was the greatest day of his life. All his Christmases and birthdays all rolled together — he was awake and alive. He’d been afraid before surgery, and all he’d wanted was to open his eyes again when it was over. In this voicemail, I can hear his love and I can hear so much pure true dad. The happy, kind, generous and excited teddy bear of a dad. The one who calls to share his happy and excitement, and also to ask after yours with genuine interest, curiousity and support. In the years since he’s been gone, I have learned how unusual this made him, how little most of us do this for each other. If I listen closely though, I can also hear that his voice is not right. Everything he says is cheery and full of relief and promise. But there are sounds on this call that belie that everything is not going to be okay. He clears his throat strangely, and there is a gurgling sound in it. When he hangs up, it takes a long time. He has some difficulty getting the handset into the cradle. The phone clunks around on the base for a while before the line goes quiet. He called me and left that message on May 7th 2011. He died suddenly a couple of weeks later on May 26th. I have not been able to handle this. I have missed him too much, and it has hurt too badly. The other day, my husband told me that after my brother called to tell me my dad had passed, I made a sound that my husband didn’t know how to describe. Then he realized that it was the sound he thought of when he’d watch The Princess Bride. The sound of ultimate suffering. The pain of your soul being wrenched apart. He said he still thinks of and remembers that sound when I am in pain now. One of the only photographs I have of me on my bike was taken by my dad. 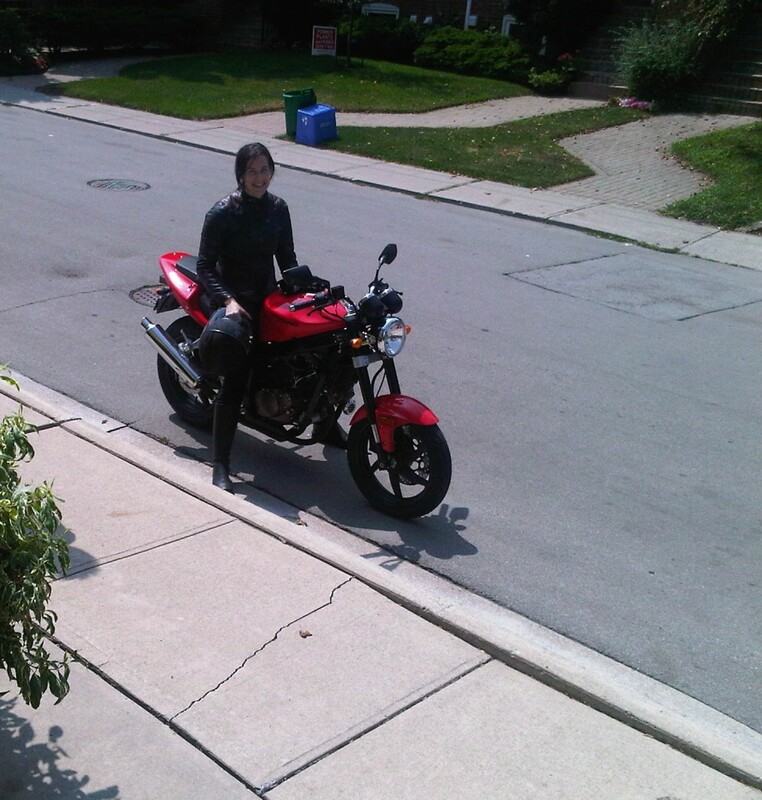 I made my very first ride on my very first bike a trip to visit him in Oakville, shortly after he was out of hospital. He insisted on taking a photo of me. It is one of my favourites. I am smiling at my dad, and he is showing me he is proud of me. My plan had been to learn on my bike by driving out to visit my dad. I thought it was perfect. It would be a nice ride along the Lakeshore, and I could go out and see him more often. He wouldn’t need to pick me up from the train. I’d go out on Sunday mornings, and when we’d get together for work, and we’d have coffee (mine black, his mostly milk) and we’d watch the boats. And then within weeks, he was dead. And everything broke. And everything changed. And I broke too. And I had this bike. And I didn’t have him on the other end anymore. What I did have was this new sense of death. Death right up close. Death up so close it smothers you. It turns off all the lights in the world and drains all the oxygen out of the air. But I don’t like to give in, and I don’t like to give up. And if I just sold this bike, if I did what I wanted to do and laid down and died myself, that dream and whoever I was along with it, might go and always be gone, and I might never find it again. And what would dad do. What would it mean about life before and after. What if everything really was just gone and there was no colour and no dreams and no point and no life. But what if the only way out was through. So I dug in – hard, blindly and unrooted. I decided I would finish this, I would get my full license. I’d zip my broken heart up and put on my helmet and jacket and I would do this thing — for the little (and medium, and full-sized) me who’d always wanted to, and because it was what I had started, a piece of the path that had just been blown apart. A road connecting before and after. I’d passed my first test with flying colours, and my instructors suggested I’d be good as an instructor. I turned visits to my dad into much further and chillier early morning visits to my aunt’s farm. I’d arrive shivering (and a little purple) but triumphant, and re-anchoring to family I had drifted away from. I practiced, and took lessons, and got good. My bike and I appeared on the cover of the riding school pamphlet. I got better, I learned how to handle a big unwieldy bike with skill and confidence, and I remained broken. I kept practicing. And I took my second and final test. I passed it only 2 points shy of perfect. When I found out in the parking lot afterwards, I nearly sobbed with relief and pride and accomplishment and loss. When I got home, I let that sob out. After that, I had some moments of pure bliss while riding. Riding in the early morning, through thick sweet meadow air just north of the city, coming across a pheasant, watching the sunrise, riding a motorcycle on open quiet long roads. It is heaven on earth. I felt absolute and total joy and comfort and ease. And when it was time, on a cold Easter weekend, for my brother and sister and me to scatter a small box of my dad’s ashes, I rode my bike back out to Oakville to do it. And back home, year over year, every time I picked up voicemails, I would resave my last message from my dad. Usually, I would skip it. 3, 3, 9. (Fast forward, fast forward, resave.) Very very rarely, I would listen to it. But mostly, I just kept resaving it. 3, 3, 9 and go on about my day. I’d notice I wasn’t ready to delete it, but not know why or when that could change. After a couple of close calls where I’d delete a run of spam messages and nearly hit 3, 3, 7, I saved a copy to a backed-up drive. As the years passed, I was able to delete his entry from my cell phone, my home phone, my address book, but I couldn’t delete that voicemail. The relief and joy of riding began to diminish, and as a couple more years went by, I noticed just how hard it was to get from the thick of downtown Toronto out to the fields and birds and soft and quiet. How I was trading 2 hours of cold and busy and angry drivers to get out to those fields and that peace. And how maybe it wasn’t balancing out. Where was the line between the pain and the pleasure? What had I set out to do? Did I have any further to go, or had I arrived there while I wasn’t looking? Yesterday, I sold my bike. One day, maybe I will buy another one. Maybe for now, I’ll rent. Maybe I will do some more off-road riding — starting and ending in the woods. Maybe I won’t. Maybe I’ll enjoy all the future possibilities all that pain paved for me. Maybe I don’t need to rush. Maybe I’m not sure what happens next. Maybe I’ll figure it out as I go. But yesterday, I let go of that bike, and today I was finally able to let go of that voicemail. This bike that I had this troubled relationship with, these big ups and big downs, I let it carry some of the pain of these past few years. The struggle. The struggle when the struggle was too tough to really make any sense. The freezing cold mornings to avoid the traffic. The desperate slogs out of the city to find somewhere there was oxygen in the air. What it felt like to try and figure out a way forward into a future you couldn’t imagine, and didn’t want. I let them go just before the calendar ticks over to another year without my dad here, another year of never hearing a new voicemail, never hearing his voice say any more words. Every year, inching forward. Every year, figuring out how to breathe, what to hold on to, and which things it’s time to let go. I think dad would understand, and I think he’d still be proud.